The chick is still alive and appears to be in good shape. I saw the parents feed the chick still in the nest and they payed no attention to the one on the ground. I'm hoping that they feed the grounded chick at night so as not to call any attention to the chick. Although I am at least 100 yards away from the tree, both parents took an interest in me today - each one, at different times flew toward me and turned, this has never happened before. There was no threatening motions or sounds from them, they just took a closer look. This gave me an opportunity to get a decent shot as they turned and flew off. You may want to call Animal Rescue Howard. They are NOT feeding it. It is the weaker of the two siblings and was forced out of the nest by the larger. It will die either to a predator or starvation if you don't take immediate action. I agree. I would call Forest Rangers (or similar) which could direct the call to the appropriate dept or service. The egglet probably needs to be back in the nest to get fed. I recommend calling the Forrest Rangers or the game warden. 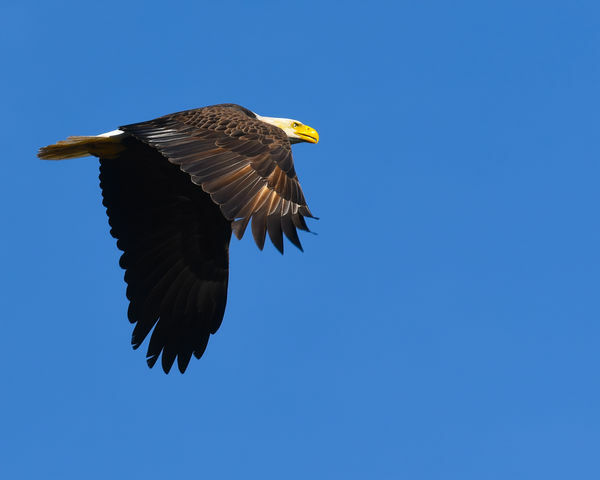 if you touch the eagle, even with all the good intentions, you may be running afoul of a boatload of federal laws … the US Attorney's office wants nothing more than a high conviction rate - they don't give diddly rip if you've saved the bird or not... I work with enough folks who have done time, and I can tell you that a felony (especially a federal felony) is not something from which you ever recover. "This afternoon I was informed of a young eagle on the ground beneath the nest tree. LD and Jamie *** of Candlestone were photographing this active eagle nest when they noticed the eaglet. They called me, then I called the wildlife rehabber I have worked with in the past. Anita and I arrived at the site and discussed how to get to the bird on private property to rescue him. Anita climbed through a barb wired fence with her gloves, net, and towel The eaglet was scooped up, secured and Anita made her way back to us watching in awe. We were waiting with her large container, helped her back through the fence where the bird was examined and placed in a secure container. All this time the eagle parents were circling overhead and calling for their youngster. A second baby eagle remained in the nest. No serious injuries were noticed and Anita took the bird to her wildlife sanctuary. I informed my friend who monitors local eagle nests, including this one. She reported that Birds of Prey in Orlando will pick up the bird. Hopefully any injuries were not serious and this young eagle can be returned to his nest, parents and sibling.Thanks LD and Jamie." I have watched this eagle pair for six years now and each year they have had two chicks. I have never seen the chicks have any serious quarrels. I tried looking up some information on the subject and have found mixed conclusions as to whether an older or larger Bald Eagle chick will kill its sibling. So. in spite of what you claim, I will go with my six generations of watching this family and believe that the parents were taking care of the fallen chick. Look at the photo I took earlier today. The chick was walking around there were no calls of distress to the parents... that chick did not look like a chick who was dying in spite of the fact that it had been living on the ground for at least 4 days. If I had thought otherwise, I probably would have called the authorities myself. I won't create an argument about this and maybe each eagle pair is different. I spent 3 years in Florida in the early 60s. Out of the five nests I watched all started out with 3 hatchlings. Three of the pairs fledged 2 and the others fledged 1. What happened to the others I don't know. Of two Goshawk nests monitored in California in the 70s both had 3 hatchlings. One pair fledged 3 the other 1. If the tree is climbable they can place the eaglet back into the nest after a checkup and no injuries are found. Most likely just fell out of the nest on its own trying out its wings, happens a lot. We had an eaglet fall out of a nest that was not climbable. 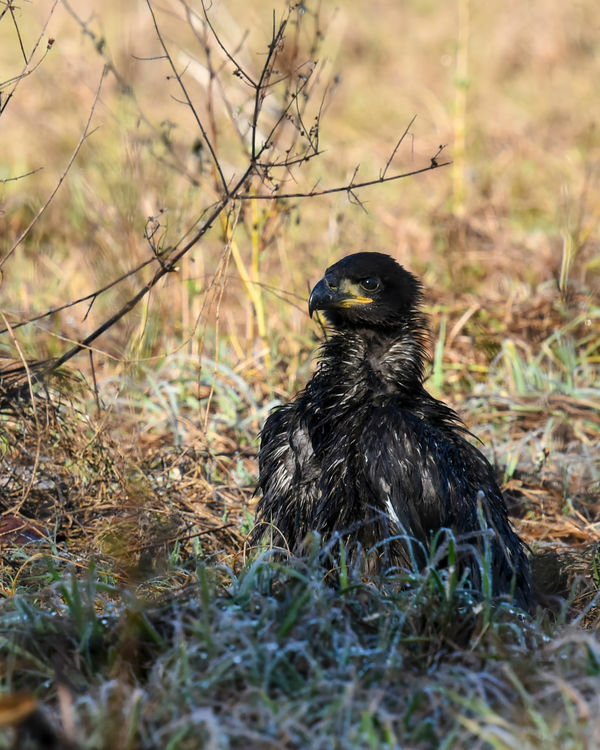 After checkup eaglet was placed in a nest with one young of similar size. Owners of property kept an eye on the nest and it was determined that parents were feeding both young. I have been part of an eagle banding crew for over 25 years incase anyone is wondering how I would have information on something like this. The plan is to return the chick when it is able to fly. The reasoning is because the nest is at the top of a dead tree it would take a lift of some sort and the approach to the nest might frighten the chick still in the nest to the point it may jump out and injure itself. When the grounded chick can fly it will be released close to the tree and hopefully will simply fly up to the nest. I hope to document the return. It was decided by the Audubon folks to place the bird in another nest which only had one chick. The parents accepted the new chick and he/she is alive and well. A happy ending to the story.